Join Bergen County Camera for a bus excursion to the Mohonk Mountain House in New Paltz, NY. Built on the deep-blue waters of lake Mohonk in 1869, this grand 265-room Victorian castle is one of America’s oldest family-owned resorts. 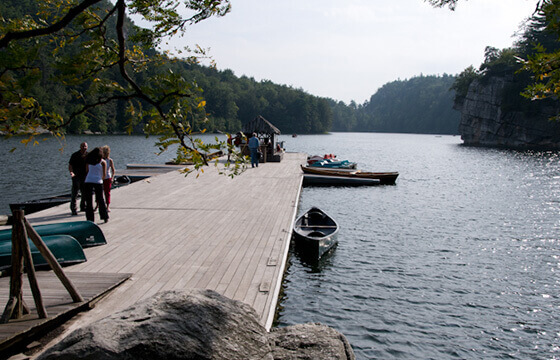 Mohonk – or “lake in the sky” – is a sparkling wonder, tucked away at the top of the Shawangunk Ridge. Tour the award-winning Show Gardens, or lose yourself in the Victorian maze. We'll meet back at Biggie's at 9:30PM to return loaner lenses and wrap-up the evening. A follow-up Focus Session will be held in our store on Saturday, June 30th at 9:30am to critique images from the trip. Each attendee will receive a FREE 11x14 print of their favorite image from the trip! This is a meet-up trip and does not include transportation or parking. Tamron and BCC staff will meet at Biggie' in Hoboken at 6:00pm on Tuesday, June 19th. Tamron Tech Rep Erica Robinson and Sales Rep Patty Gregitis will demo the full line of Tamron lenses and will be on-hand to answer questions on night photography and choosing the correct lens for the evening's shoot. Free Tamron Lens Loaners for attendees. Enjoy appetizers and conversation with other fellow photographers and staff from Bergen County Camera. From Biggie's, we'll walk over to Pier A Park. From this location you can get some great shots of the NYC Skyline as the light changes at the end of the day. Tamron's Tech Rep Erica Robinson and Bergen County Camera staff will be there to help you capture some Great Night Skyline images. Tickets are $50.00 each and cover a pre-trip class on night photography, personal assistance during the shoot and a post-trip class and critique with a FREE 11x14 print.